I have had this rash of red/brown spots on my skin for the past three years. It does not seem to clear up with the steroid creams that they gave me. 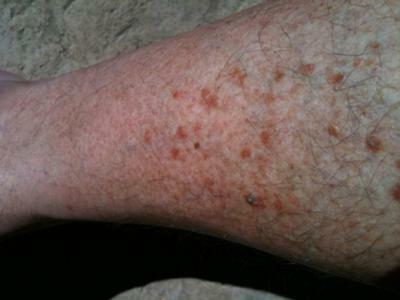 The skin rash seems to come from under the skin and then some will scab up. The rash itches at night. Any insight on this skin rash problem would be helpful. I have been dealing with this since last year. It started out as a small patch over my ankle. Then it spread up the leg and across my foot. It itches and I have to wear a sock to bed. I am hoping the Blue Star ointment and Selsun blue pearls help. If not, I'll try sulphur. Did you find out what exactly this was/is? I have been searching to find out what my husband could have and this looks exactly like it! Just can't find a name for it.